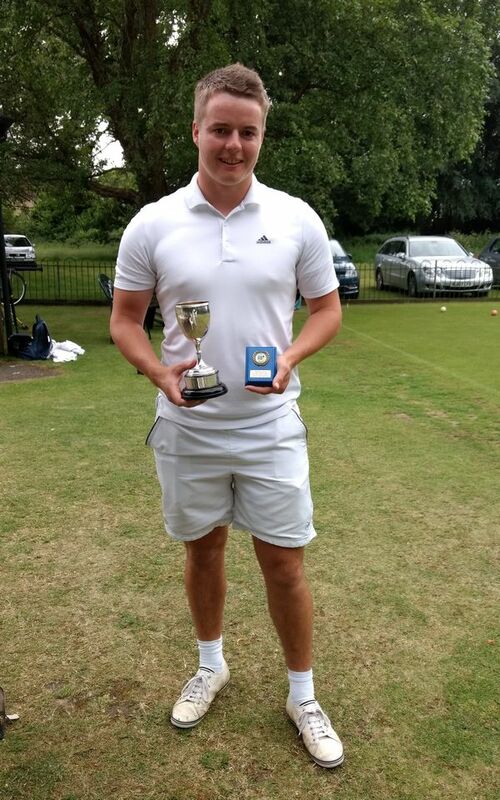 This Tournament is a one-day Association Croquet singles competition for both Level Advanced and Handicap Advanced play, held at Watford and open to members of the national Croquet Association. It is also listed in the CA fixtures calendar. Title: Watford One-Day AC Level Advanced Tournament. Entries: Allocation: 2 April. Closing: 2 June. The weather was warm and mostly sunny, the courts were medium-paced but getting a little variable after a recent dry spell, the hoops firm, and the entry was the strongest that the club has ever had with half of the 8 players having scratch or better handicaps. Everyone had arrived early to ensure a parking spot next to the courts because of some other events in Cassiobury Park which prevented access for cars into the park after 9am, so play started 10 minutes early. A good day was in prospect. The first round was seeded, and all 4 games were concluded according to the form book well within the 3-hour limit, with the stronger players all winning fairly comfortably. In the second round Bryan Harral had a narrow win against Adrian Kirby, which would have gone the other way but for Adrian's poor approach to penult on what should otherwise have been a winning 3-ball break to finish; Daniel Gott won well against Gary Bennett in spite of several unsuccessful attempts at a 4-back peel; and the other two games went to time with fairly comfortable wins for Arthur Reed and Brian Havill. The final was therefore between the young pretender Daniel Gott and the defending champion from last year, Bryan Harral. Daniel hit in first but failed hoop 1 leaving Bryan a laid break which he duly took round to 4-back. There was some further interaction in which Daniel eventually reached 4-back with one ball, but Bryan had the better of the play while Daniel missed several long-range shots, and by then Bryan had reached peg & peg while Daniel was still for 2 with his backward ball. Bryan laid up on the south boundary with a 4-foot rush to peg, Daniel shot and missed, but Bryan's rush to peg was wayward. Another lay-up by Bryan, another miss by Daniel, and Bryan had a dolly rush on partner to peg out from only a few yards away. All over now, surely - what could go wrong? A "grievous"!! - Bryan rushed his other ball into the peg, leaving his striker's ball still a few yards from the peg unable to take croquet. So that left peg and box vs. 2 and 4-back. But Daniel's last long-range miss at Bryan had left his own two balls close together on the south boundary, and this time he was able to pick up the break with his hoop 2 ball, a 3-ball break which he carried with good control round to peg, leaving Bryan near corner 1 and his own two near corner 3. There was no lift for Bryan as he had (accidentally!) pegged out one of his own balls, so he lagged to the middle of the west boundary for a better shot. Daniel then kept his cool with a good 2-ball break from 4-back to win +1. A remarkable turn-around, and a further reminder that you are never more than 2 turns away from finishing, and that a game is never won or lost until it is finished!